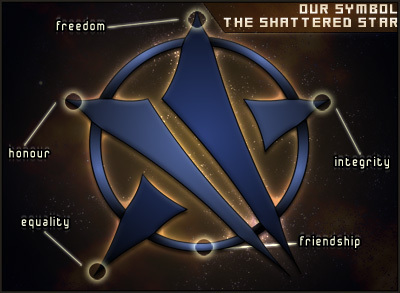 The Shattered Star eXiles (SSX) is a gaming community originally founded in 1997 (initially as the "Shattered Star Confederation" [SSC]) under the principle of 5 core ideals; Freedom - Equality - Honour - Integrity - Friendship. Whilst we do not tend to have these as our written law so much anymore, these ideals are still a part of who we are and what brought us together. Here at the SSX fun, friendship and community are what comes first. We don't strive to be the best of the best, though we welcome friendly competion. We may have been very successful in other games, and we will of course celebrate our accomplishments as a group, but we're not overly concerned with becoming top dog. As long as we're having fun whilst we play in our own way, that's all that matters. We do not recruit based on either your skill or your gear. We may, of course, chat to you during the recruitment process, or come and play with you for a short time, but this would be purely to get to know you as a person and find out what you're looking for in a group - whether our community could be what you're looking for. We believe in quality over quantity regarding recruitment. We've never been interested in recruiting for numbers alone, nor of building groups around gear, class or raiding experience. We care about our members and would much rather have a smaller, close-knit group who get on well together and enjoy playing through content with each other than a large guild with no other interest than progression through nightly raids. We don't impose activity limits upon our members, and nor are we selective over specific classes or specs. It doesn't matter whether you play 7 hours a week or 20. Play as much or as little as you can, when you want, how you want. We will make no demands of you in this regard. We don't allow multi-clanning on the same server, which is a rule we have often applied throughout our long history online. We feel that people splitting their committment across various guilds on the same server can cause problems later on, so we prefer to avoid this. All of your alts are welcome in our guild alongside your main character, but if you'd rather leave some of them guildless for whatever reason that is up to you. That said though, if you want to join another group on a different server then we have no problem with that. We don't impose any age restrictions. As a very diverse gaming community we've had people across a broad spectrum of ages join us over the years, from all walks of life and from all over the world too. Many of us have grown from young teens to adults and moved from one MMO to another together since we've been here. All we ask is that you act in a mature manner, treat others with respect (including other players outside the group) and to try and help fellow members out if and when you can. We don't have a "leader" per se. Instead, each of our groups has a set of moderators (or officers) to share the workload between them, and our community as a whole has what we call an Arbiter. This person is voted for by the community on a yearly basis, and is there to ensure that everything runs smoothly. We don't require our members to use voice communications software. Some of our members may choose to use these together, but use of such things will not be a requirement for membership in our group. We do make use of IRC outside of games, which a few of us use/idle on. Details of this can be found here. It can be quiet at times when we're all doing other things, but you are welcome to join us on there. Again though, this is not a requirement for membership of our community. We do require SSX members to register on our official forums. Since we're a community not restricted to just Mechwarrior Online, participation on our forums is necessary as we are much more than simply this one game. We'd like to hope that you will stick around and maybe play some other games with the group even when you come to leave this game. We believe that friendship shouldn't end with just one game! Over the years we have enjoyed tremendous success in many games through applying the above principles. Just a few of these games are: Mechwarrior, Freespace, Freespace 2 (we're even in the credits), Tribes, Neocron, EVE Online, LOTRO, World of Warcraft and The Old Republic. We hope that Mechwarrior Online will become the next chapter in that history, and we'd love for you to be a part of it. If you feel we might be right for you, feel free to contact us through either our forums or through Private Message ingame.